After my recent splurges, I have decided to try to not buy any new yarn for the next few months. I was therefore excited about the recent yarn swap to mark the second birthday of my local knitting group. I took the left over alpaca yarn from my Top Down Round Yoke Cardigan, and I got 2 balls of Rowan Damask in return. I decided to make a mini version of the Round Yoke Cardigan for Eva. As I only had about 200 metres of yarn, I’m making a cropped, cap sleeved version. 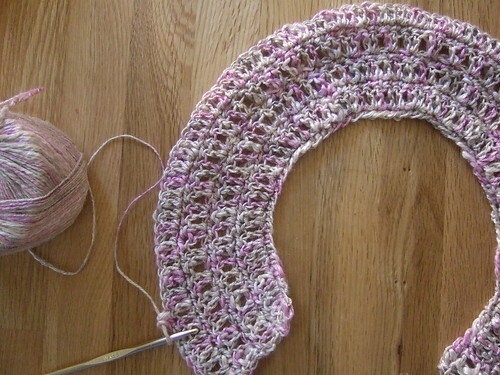 It’s coming out really nicely, and I should just about have enough yarn. It’s working up really quickly. I started it 2 days ago and I am now on the button band. I will post pictures of her wearing it when I have finished. I like Damask; I did my hairpin lace vest in it, and I’m thinking about crocheting a skirt with it. Your cardi looks very sweet!